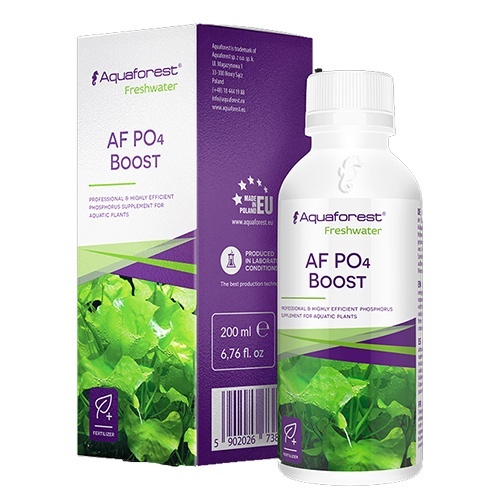 10 ml AF PO4 Boost dissolved in 100 liters of water raises the phosphate level by 0.4 mg / l. Take them with water, then plant the plants and make up the aquarium with water. Recommended parallel use with AF Micro, AF N Boost, and AF K Boost. Absorbents such as zeolite and/or carbon may reduce effectiveness of the formula. The phosphate level should be under control. Its excess may result in growth of algae, especially the red algae. Only for aquatic purposes. Protect from sunlight. Keep at room temperature in a tightly closed container, keep out of reach of children.